LAS VEGAS (AP) — The global hit "Despacito" has made good on three of its four nominations at the Latin Grammy Awards. The summer smash by Luis Fonsi featuring Daddy Yankee won record of the year Thursday, as well as short-form video and urban fusion performance for the remix with Justin Bieber. "Despacito" is also up for song of the year. Fonsi dedicated the record of the year prize to Puerto Rico, hard hit by Hurricane Maria in September. The ceremony, broadcast live on Univision from the MGM Grand Garden Arena in Las Vegas, opened with a moment of silence for the storm-ravaged island, followed by a performance by one of its native sons. Wearing a T-shirt emblazoned with the Puerto Rican flag, rapper Residente performed his song "Hijos del Canaveral" ("Sons of Canaveral"), a tribute to his homeland. Residente tops nominees with nine nods for his self-titled solo debut and he was an early winner Thursday, claiming prizes for urban album and urban song for "Somos Anormales" ("We Are Abnormal"). Juanes was also an early winner: "Mis Planes Son Amarte" ("My Plans Are to Love You") won pop-rock album. 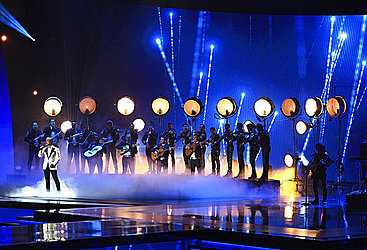 Most of the awards were presented during a pre-telecast ceremony, while the live broadcast is dominated by performances. Performers included Natalia Lafourcade, Maluma and Carlos Vives. The largest celebration of Spanish-language music comes at a time when many Latinos are wondering if there's anything to celebrate this year as they've felt the effects of the Trump administration's immigration agenda and their communities were destroyed by natural disasters.